Adrianna has dedicated her career to advocating on behalf of children. She provides a voice for children, defending their legal rights within their school or the criminal justice system. She seeks to work collaboratively with children and their families, providing support and guidance during these challenging and emotional times. Adrianna has worked with children of all ages, with varying mental and behavioral health needs, from diverse backgrounds, and prides herself in providing practical solutions based on each client’s individual needs. Her passion for ensuring her clients feel heard and vindicated is the foundation of her practice. 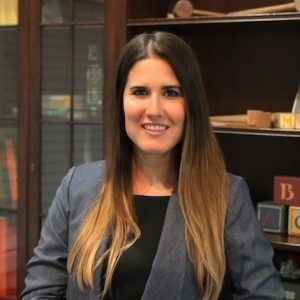 Prior to joining Kershenbaum & Raffaele, Adrianna was a Supervising Attorney in the Child Advocacy Unit at the Defender Association of Philadelphia. Adrianna worked in the Child Advocacy Unit for nearly ten years, where she represented and counseled children in all stages of dependency proceedings and in matters contemporaneous to their dependency such as adoption, education, truancy, school discipline, and delinquency. During her tenure, Adrianna represented thousands of children and spent extensive time in the courtroom advocating for her clients’ rights. Before moving to Philadelphia and joining the Defender Association, Adrianna served as a Judicial Law Clerk to the Justices of the Probate and Family Court in Massachusetts. During law school, she worked as an intern at Greater Boston Legal Services: Family Law Department, an advocate at the Domestic Violence Institute at Boston Medical Center, a legal research assistant, a staff attorney at the New England Law Clinical Law Office, and a note editor for the New England Journal on Criminal and Civil Confinement. Adrianna is a self-proclaimed “foodie” who enjoys traveling and spending time with her family. She lives in Montgomery County with her husband, Randy, and their two sons.